Ellesmere Choi is involved in the "Salty Pork Hand" case, but currently his work is still ongoing, and he will be joining the crews for "My True Fathers" as a doctor. The case is uprising in TVB, but because the female victims don't dare to reveal anything, a police report can't be made so all the guys involved in the suspect rumours such as Ellesmere Choi, Joe Ma, Moses Chan and Ron Ng are not affected by it and continue working. In addition, Ellesmere Choi has been arranged by TVB to film in "My True Fathers" as a doctor where he has to check on patients. 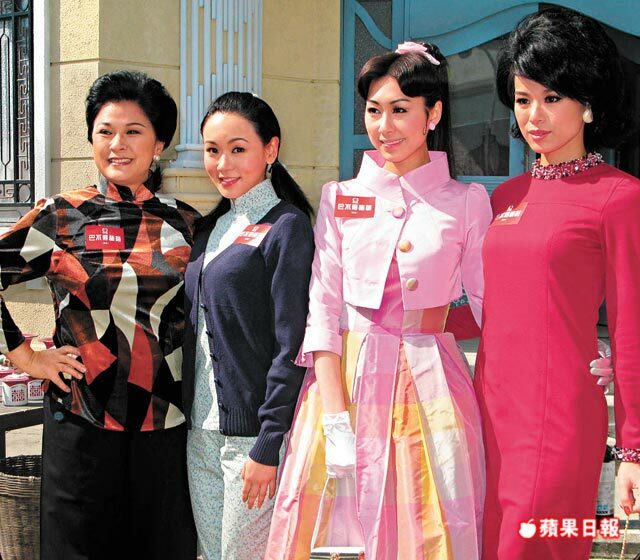 The main actress of the drama, Myolie Wu, expressed that she will see the whole thing from a neutral point of view. With the "salty pork hand" news, there are many discussions going on among the staffs in tvb, guessing who the real culprit is. Myolie said: "The victims didn't say is who, cannot just say its someone without any evidence. But i feel that a woman who has such an encounter should say it out, cannot tolerate." Myolie has worked with Ellesmere Choi many times, last year, they attended a charity event too. Myolie continued to say: "That time, when i was filming a crowded scene in 'War and Destiny' in Mainland, i was touched on the pat pat by a temp, and it was during recording, i immediately grabbed both of his hands and shouted "you touched me!" And he was taken away, i really regretted not beating him first that time! Girls need to protect themselves, cannot keep quiet because of fear, being violated is very disturbing and ugly, i support that girls must say it out." Myolie emphasized that if unfortunately, she meets salty pork hand, she will definitely use her flying kick and two punches. After the "Magician Pervert" incident, Ella Koon revealed that during filming, there was a male artiste whom attempted to take advantage of a female artiste. When asked if will be more alert towards the surroundings, Myolie said, "Won't be too worried as well. Perhaps recently, there were too many of such incidents happening. I've never experienced this before in the company. Instead, I've met one before when filming in China." When asked if one should stand up against the culprit if such an incident was to occur, she replied, "Of course one must. And don't be frightened." Myolie Wu: On the 5th of this month, she revealed that an extra molested her when filming 'War and Destiny' in China. The extra was immediately fired thereafter. Last night, Bosco attended a function and gave out red packets, reporters asked when he will marry Myolie and give out red packets together, Bosco spoilt the teasing and said;"huh! Then i'm really having a flu now! Wait till i have established my career first,and boss gives me an increment first la!" (you just joined, so fast asking for an increment?) "by the time, say and discuss, almost la!" Earlier, Myolie openly expressed that someone has touched her pat pat, Bosco said:" very long ago already! have two years already." (She told you?) "Yeah ah! But i can't help her because i wasn't in Mainland" (Did you teach her how to defend against the molesters?) "Girls really have to be careful! there was once i was performing and someone tore a little part of my clothes, i only know about it when i got home." This was the first year that Bosco attends East Asia Recording Company celebration. He was asked to perform, but he expressed that although the boss is around, he does not feel pressured. Last Night, he gave out red packets too, reporters teased him and asked when will he be giving out red packets with Myolie, he spoilt the teasing by saying he is currently having a flu, wait till he has established his career, then think about it. Mentioned that Myolie has been touched on the pat pat before, asked if she confided in him? Bosco smiled and say: only telling me, it was 2 years ago, and it happened in China, i also can't helped her then" Did you teach her how to defend against molesters? He laughed and said: "taught her tiger eagle fist, actually girls have to be more careful, even when i went to macau for my performance recently, also got touched." As an actor, Bosco is also afraid that he will be accused of such things, mentioned TVB little investigation team is trying to catch the culprit, he expressed that he will not have any pressure, because when filming intimate scenes, he will communicate with the opposite party first before filming. When filming kissing scenes, what if can't be controlled and accidentally, went on with tongue? He laughed out and said: "very seldom, tv dramas target family audiences, movies target a bigger group!" He expressed that he heard from rumoured girlfriend, Myolie Wu about it, and he reminded her to be careful and needs to protect herself, he said:"happened two years back, in mainland, she told me about when she came back to Hong Kong, i also feel that females have to be extra careful." thanks for the translation linn. female artistes are more of a target. they need to learn self defends like myolie to kick those molester in the $#%. I'm not going to say much about this topic. Frankly, I wish this topic would just go away now, because, not that it's not worthy of telling, but it wasn't handle right by all parties involved and TVB management. I'm happy to know Myolie isn't a victim from all of this and hope none of her friends and colleagues are affected as well. Just my opinion. Ouch I didn't know that someone tried to take advantage of Myolie during WAD filming. Good thing Myo reacts fast!